So we are finally starting to get back into the groove of things and it's been a delight spending some time outdoors with the little man, just as we did before Baby G arrived on the scene. I am still not completely over the c-section but I getting there and I think the fresh air is helping. This week we enjoyed some time taking Sam the dog to a local greenbelt. As you may have noticed Mr A is currently obsessed with camouflage and pretending to be either in the SAS, Scouts or Bear Grylls. He loves taking his compass out with him and keeps running over to ask what direction we are heading in. 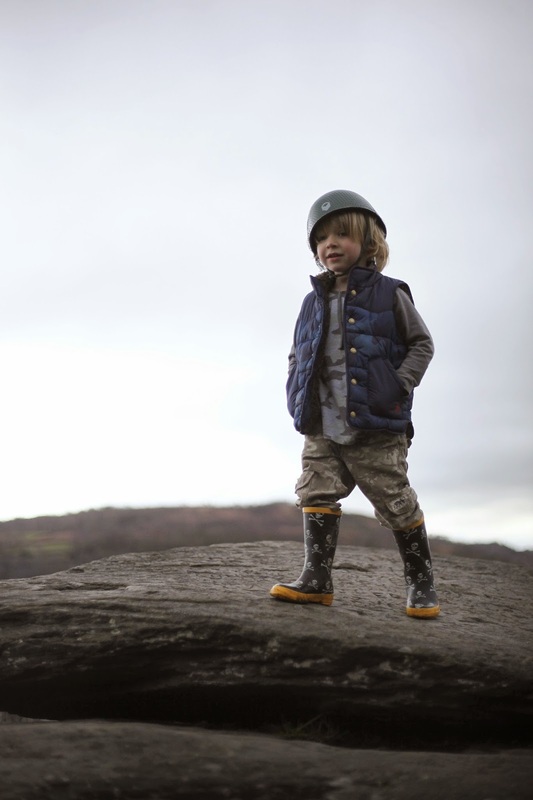 It's these simple pleasures that makes me smile, nothing but some quality time spent climbing trees or rocks, looking and learning about plants and squelching through mud in our wellies. We have been talking a lot about camping lately and we are all getting excited at the prospect of spending some time under canvas this summer as we have done since Mr A was 18 months old. We are hoping to take out tent a little bit further afield this summer, hopefully to Guernsey or Jersey or even the Isle of Scilly, who knows, either way we are up for an adventure. 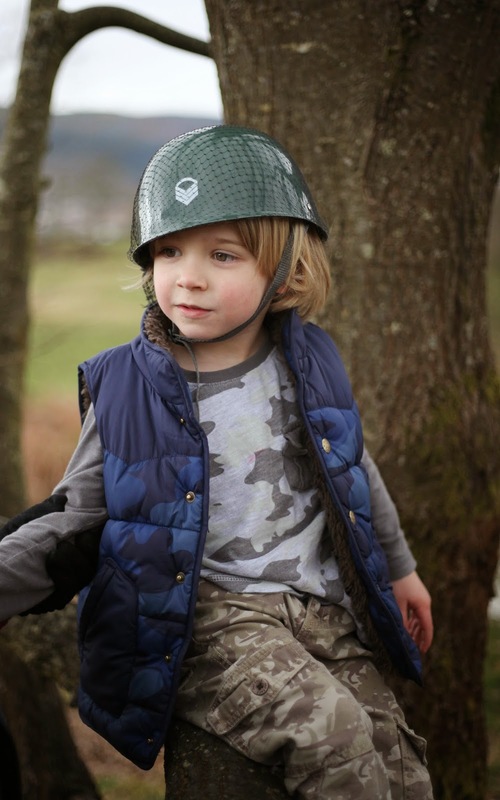 I remember all of mine going through the camo stage at about the same age as Mr A, I have to warn you it could last a while. One of mine never came through it and still wants to join the army at 16. He is the only one of my 6 who actually has a clue what he want's to do with his life. Most however move in, I was always happy to indulge this phase with them when everything is an adventure and they are of course the superhero in every adventure! 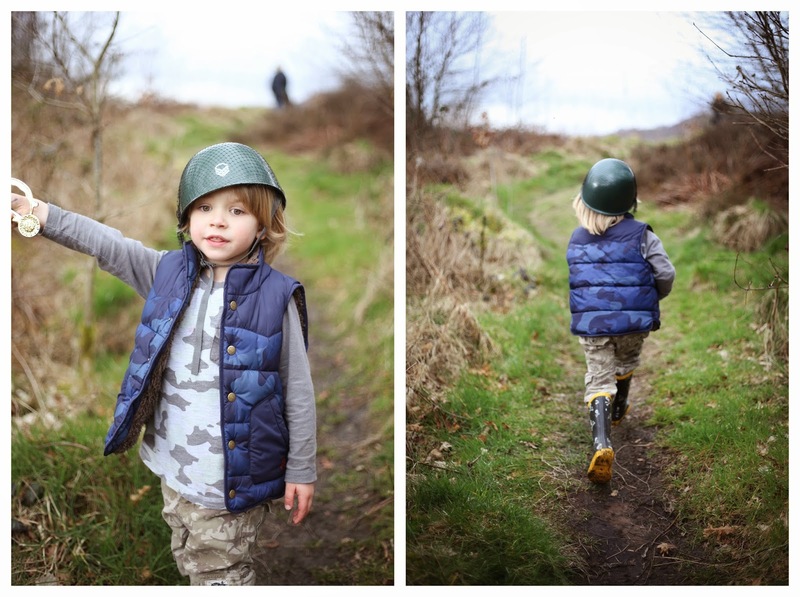 Looks like Mr A has plenty of imagination to make the most of nature and his camo gear on a family walk. thank you for sharing with me on Country Kids. We're looking forward to camping a lot this year too. In fact, doing our first camping trip of the year this weekend! Such lovely pictures. Looks like he's having a good time squelching. so cute that he wants to be bear grylls. nothing wrong with learning some survival skills even if they're never really needed. i loved doing that sort of thing when i was little. in school we'd get taken to a local hedgerow or foresty area and had to forage for some food and build a 'tent' with branches and big leaves. then we got to make food from what we found (plus some supplies the teachers bought): nettle soup, and some elderflower fritters with blackberries. it was so fun! Mr A is looking so like you these days! I love his adventuring spirit too.